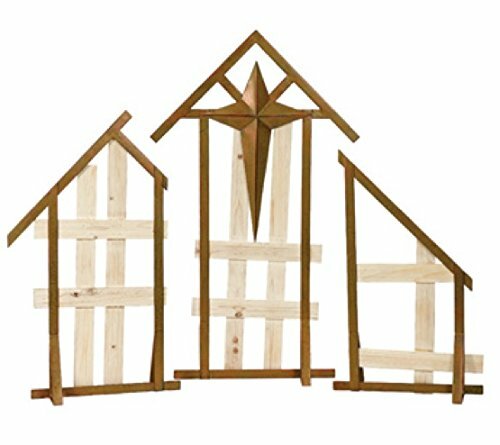 This 3 piece display creche is made of wood and metal, and includes a star on top of the tallest piece. Sizes are 25.75 x 15.75-Inches, 29.5 x 17-inches, and 38 x 22.5-Inches. This set coordinates with the Holy family set by Napco. Arrange on a table, mantle or a display cabinet. A great addition to your seasonal decorating, this set will help get you in the holiday spirit and celebrate the true meaning of Christmas. With a creative and trendy in-house design team, Napco has been bringing customers wonderful, whimsical and inspirational collections for over 70 years. We truly are your one-stop-shopping home for all your floral, garden, gift and seasonal decor needs. If you have any questions about this product by Napco, contact us by completing and submitting the form below. If you are looking for a specif part number, please include it with your message.